If you’re the type that likes to plan ahead, absolutely. There’s no better time than now to start thinking about how you’ll take advantage of the biggest spending season of the year. Let’s make sure you get your piece of the holiday pie. Looking for some Holiday Magic? Join us for a free livestream event as we show you how to meet the increasing demands of consumers during the busiest shopping season of the year. What are the key dates you should be planning for? Choose the days that make the most sense for your business. Black Friday: The day after Thanksgiving represents the start of the holiday shopping season and the perfect time to entice eager shoppers to spend their money with you. Small Business Saturday: Created by American Express, Small Business Saturday is “an annual tradition dedicated to supporting small businesses and celebrating communities across the country.” Not a bad idea to take advantage of this day that promotes people shopping at small businesses. If we had our way, every day would be a small business shopping day. Cyber Monday: The Monday following Thanksgiving promoted as a day to encourage consumers to shop online. If you have an online store, don’t miss your chance to participate with a great online offer. Giving Tuesday: For you nonprofits out there, #GivingTuesday kicks off the charitable season for end-of-year giving. It’s another reason to encourage your community to give. What emails should I plan to send? Whether you’re taking advantage of one or many of the retail holidays, use our holiday email templates to create your emails quickly and easily. And we recommend you try a three-email series to create benchmarks around your offer. The above example uses the three-email series for a Small Business Saturday offer. 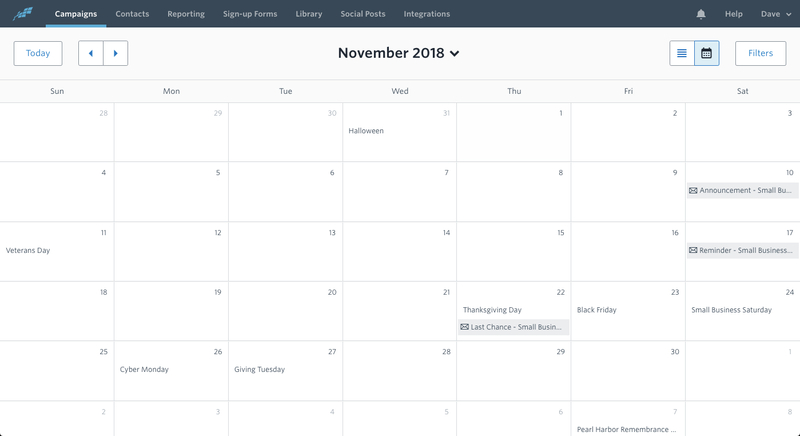 Try out Constant Contact’s Marketing Calendar to plan for your holiday email marketing. Why should I use the three-email series? Even if your customers want to take advantage of the email offer you send them, they can get pulled into something else before they can take action. And then your offer is forgotten. The three-email series gives you multiple opportunities to spur your audience to action. Start your holiday email planning now. People are going to be spending money this holiday season. Shouldn’t they be spending their money with you? Get a head start to have your best holiday season yet.